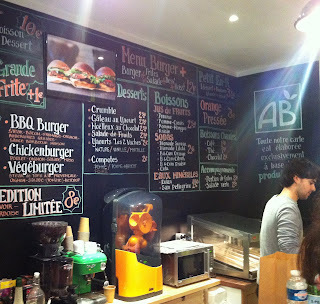 Burger joints abound in the capital at the moment, with the mobile Camion Qui Fume and the "Gourmet" burger restaurant, Blend, popularizing the plat among French diners. Each address attempts to distinguish itself by putting its own particular spin on this American classic. DEspite all these choices, many of which offer (or plan to offer) a vegetarian option, it should come as no surprise that I am particulary partial to Bio Burger's all-organic menu. Bio Burger is incredibly well organized and the servers represent the concept of the store with aplomb, all the way down to their "Bio Burger" brand shoes. The organization of the staff helps keep the growing line moving as locals flock to the covered Passage Choiseul for their lunch break. The restaurant succesfully serves its clientele, providing swift service at a reasonable price. The only disadvantage of this lunch spot is that there is not enough room to seat all the people its serves. I would suggest stopping by when the weather is nice, so you can take your burger to go and find a spot outside in the sun to enjoy it. Palais Royale, for example, is not too far away. If you are lucky enough to find a spot to sit- which should be easy enough if you are able to stop by during off hours- the dining areas are comfortable and the restaraunt offers free wifi to clients, with the network name and the password printed out on every receipt- another nice little touch of orgnization. Lunch menus range from 10- 12 euro and are comprised of a burger + salad/fries + desert/drink (12 euro gets you both a desert and drink). A hamburger alone costs 6-8 euro, with the tofu-based veggie burger being the least expensive choice on the menu and the ever changing "Edition Limitée" burger being the 8 euro option. I was happily surprised by my veggie burger which was not, as I feared it might be, a dry patty of processed soy products and a few dehydrated corn kernals, but rather a fresh mix of silken tofu with onions and spices served on a fresh baked bun with lettuce and ketchup. I wasn't overly impressed with the fries, probably because the reastaurant was too packed for me to get to and add a few shakes of much-needed salt, but home-made fries from quality pommes de terres trump the McDo version any day. As advertised, everything is organic at Bio Burger. Even the beverages are bio, which means instead of washing down your organic lunch with a corn-syrup stuffed industrial soda, you can enjoy a bottle of organic fruit soda or lemonade. I wish the team of Bio Burger much succes in their endeavor, they are well suited to expanding this first location into a larger chain of organic diners that could give their contemporaries a run for their money. Following in the footsteps of America's Northwest burger chain, Burgerville, Bio Burger provides an ethcial, sustainable fast food alternative to the pink slime slingers of our day.